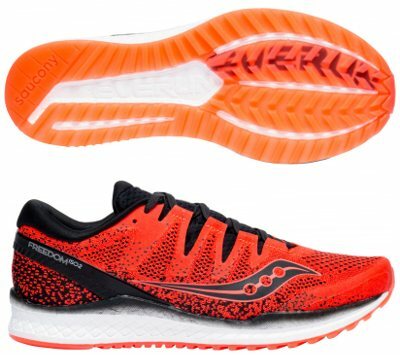 Saucony Freedom ISO 2 are neutral cushioned running shoes. The cool Saucony Freedom ISO 2 keeps the commitment from the american brand to great running shoes for "natural running" featuring latest technologies, something that typically ends in high retail price. Located somewhere between legendary Kinvara 9 and more classical "go-to-shoe" Ride ISO, current Freedom ISO 2 focus on stability improvement to enhance overall performance with great blend of cushioning and response (just 4 mm drop) to continue as pretty interesting versatile road shoe although at expensive price. As expected in such innovative running shoe, current second edition introduces several changes compared to original first one Freedom ISO. Once the flagship ISOFIT system has been refined over the last four years based on feedback from several running shoes from Saucony to offer a non intrusive but secure fit, next step has been a premium upper based on more dense ISOKNIT fabric for a more consistent frame with less overlays while allowing great ventilation and breathability in line with expectations. A similar solution to the external Support Frame used in its counterpart with pronation support Liberty ISO has been introduced to increase stability. Midsole in Saucony Freedom ISO 2 is again completely made of EVERUN (slightly firmer than popular Boost™ from Adidas) although its internal geometry has been engineered for more stability, definitely the weakest point in first edition. Outsole maintains TRI-FLEX configuration and main change is lead by longitudinal apertures (similar solution used in Triumph ISO 4) directly in fantastic Crystal Rubber to adapt better each stride and promote quicker transition.